It feels like such a big move, I blame it on last baby syndrome, but I have been putting off moving Finn from the carrycot to the seat unit on his pushchair. I am planning on using both over the next month or so, as he is still happy in his carrycot. He loves lying there playing with his feet, and he still has 2 or 3 naps a day, so is most comfortable lying down. At 7 months he is more aware of the world though, more able to hold his head up and he can sit unaided. He likes to watch, especially when it means a better view of his brothers. As a non driver, I tend to use a parent facing pushchair as it has so many benefits for both parent and child, and all three of mine prefer it to being world facing. As Finn is still so little, I feel that having a nice buggy liner helps keep him cosy and protected in his new environment. 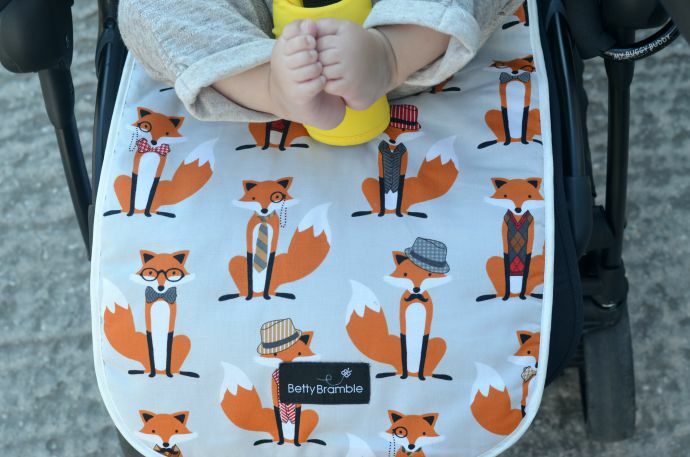 I have shared before how much I love our Betty Bramble footmuff, and their liners are just as stunning. They are thick, soft and well made. 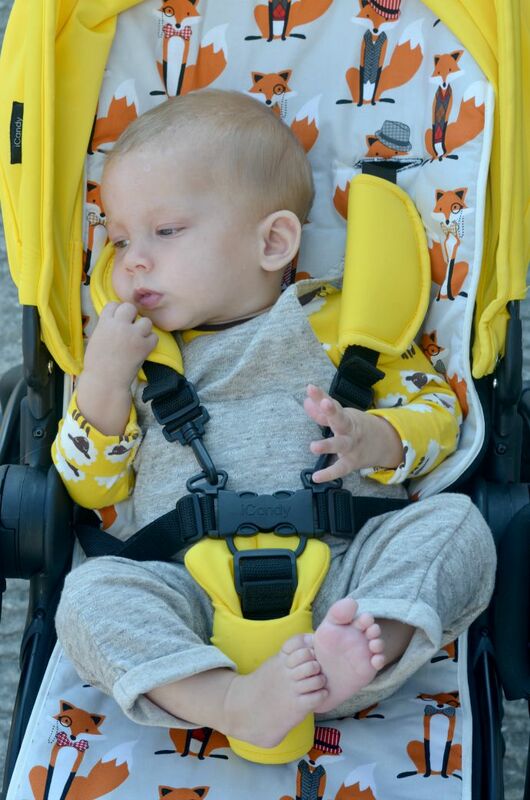 They fit most pushchairs and come in a variety of designs. Mr Fox is my absolute favourite, but then I do have a bit of a love of foxes at the moment. They are reversible, with a plain corduroy on the opposite side and machine washable at 40 degrees which is very important with a baby and the inevitable sticky fingers. There are a huge variety of designs, and they are all in the sale now at an incredible price. Finn is also loving his first pram toy, these simple bears from Ambi Toys. There are 5 little plastic bears on a string, Ted and Tess and they rotate and can be pulled around as the strong connecting them is super strong elastic. This pram toy has the simplicity and style of a toy that I would have played with as a child, and just like the old toys, it seems to hold my children's attention more that the all singing all dancing toys we now see everywhere. Finn seems fascinated with it, and usually falls asleep holding one of the bears. 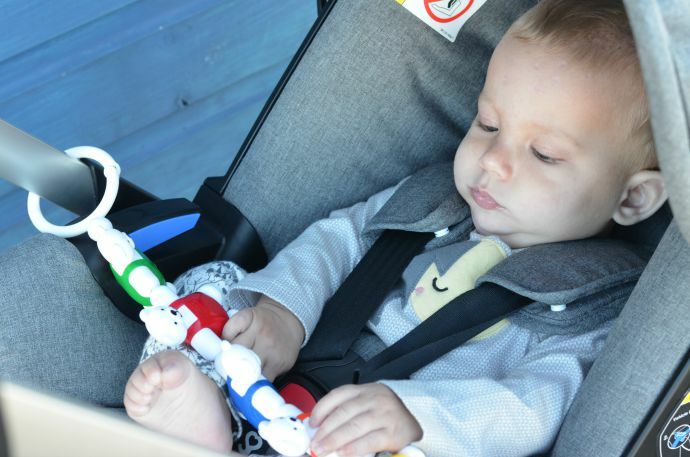 It attaches simply to his car seat or pushchair and according to the dinky one, tastes pretty great! At £9.99 it is pretty averagely priced for a pram toy and this is well made and durable. I am not ready to part with the carrycot completely yet, it is ideal if we are staying out late as Finn gets to sleep securely and comfortable and there is something so special about pushing a proper pram with a little baby in it. I am reluctant to let go of those new baby days that seem to pass by so fast, but this little person seems determined to grow up.